Saturday afternoons have never been the same since the demise of World Of Sport, and when ITV cancelled the wrestling I was devastated to say the least! I particularly used to look forward to the arrival of Big Daddy, who would enter the arena wearing a Union Jack jacket with the theme tune "We shall not be moved" playing in the background. Half the country would join in with his "easy, easy" chant. It was all pantomime, of course, but us Brits love a bit of pantomime. What we all really looked forward to, though, was the arrival of the ultimate wrestling bad guy, Giant Haystacks. If this mountainous caveman turned up then you knew you were in for a fun afternoon, although his menacing face used to scare me to death! 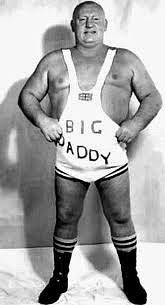 Thankfully, Big Daddy always won every match, but the British public wouldn't have had it any other way. If you're looking for a 70s, 80s or sports costume idea for a party or event, or maybe a charity run, then why not dress-up as the wrestling legend? You can buy a ready-made costume (which includes a wig) from Amazon, which is available in standard and extra large sizes. Many fancy dress costumes don't actually include the wig, so this outfit is actually a good buy. 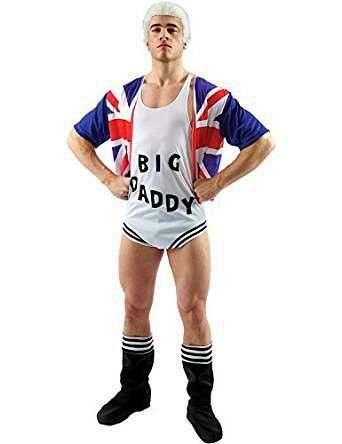 This is a pretty authentic-looking Big Daddy costume and includes a white jumpsuit with the words "Big Daddy" emblazoned on the front, and a short over-gown/jacket with a Union Jack print. Also included are a pair of black boot tops. As there is no padding with costume I would suggest shoving a cushion or pillow down your front for a more realistic look, unless, of course, you already have a larger frame! The links below will take you to Amazon and ebay allowing you to compare prices.